Insufficient bone volume is a common problem encountered when rehabilitating the edentulous posterior maxilla with implant-supported prostheses, as treatment is limited by the presence of the maxillary sinus together with the loss of bone height. Although there are various options available to the clinician to treat edentulous patients, the use of short implants offers a viable, predictable treatment option. In these conditions, short dental implants with an intra-bony length of 8mm or less are used as an alternative to bone augmentation for placing longer implants. Bone augmentation procedures are technically more demanding than placing short implants; they are associated with higher postoperative morbidity, complications, longer treatment periods and an increased number of surgeries. Therefore, taking into account the results of previous RCTs and systematic reviews, it is possible to suggest that short implants may be as effective, if not more effective, than longer implants placed in augmented posterior jaws, at least up to 3 years after loading. Bone augmentation procedures are technically more demanding than placing short implants. Shorter treatment times. The easier procedures make these short and ultra-short implants eminently suitable for use in everyday dental practice, making implant treatment more accessible to more patients. achieved similar (in the maxilla) if not better (in the mandible) results than longer implants placed in augmented bone. Short implants might be preferred to bone augmentation since the treatment is faster, cheaper and associated with less morbidity. When 35 patients returned for 3-year follow-up, there were no statistically significant differences in implant or prosthesis survival between short and long implants: three long implants failed early in one patient owing to failure of the graft, and two short implants failed at two years post-loading due to peri-implantitis. However, 18 complications occurred in 13 patients at augmented sites versus four complications in three patients with short implants. In grafted sites, three mandibular grafts were removed because of infection; there were seven cases of temporary paraesthesia; one patient with peri-implant mucositis at two years, four instances of perforation of the Schneiderian membrane during sinus lift, and one chipped crown. At short implant sites, one mandibular abutment screw loosened at two years, and one prosthesis decemented. In mandibles, mean peri-implant bone loss was 1.25mm for 6mm implants versus 1.54mm for long implants – a statistically significant difference. Similarly, in the maxilla, mean bone loss was 1.28mm for 6mm implants compared to 1.50mm for long implants. When asked five months post-loading which side they preferred, all patients indicated preference for short implants, except for five who reported no preference. In a 2012 systematic review of 2 RCTs and 14 observational studies by Annibali et. al. 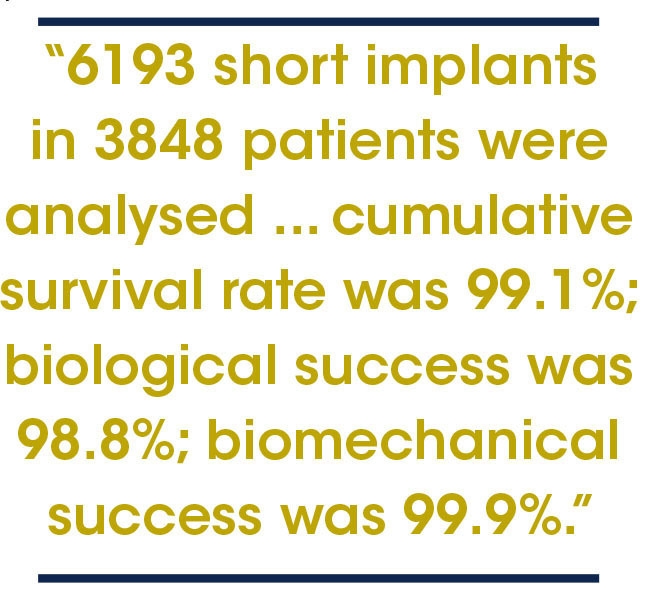 (4), 6 193 short implants in 3 848 patients were analyzed. Mean follow-up period was 3.2 (SD 1.7) years. Cumulative survival rate was 99.1% (95% CI: 98.8-99.4); biological success was 98.8% (95% CI: 97.8-99.8). Esposito found that the patients themselves preferred the side of their mouth treated with short implants to the side of their mouth treated with grafting procedures(3). 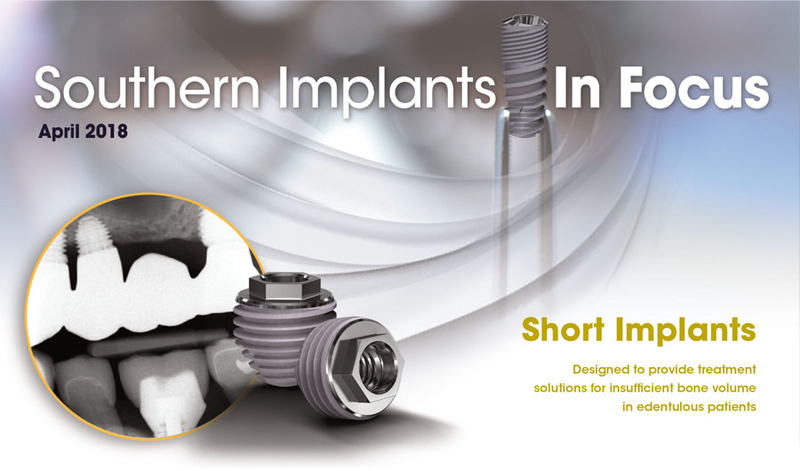 Southern Implants developed ultra-short implants with an external hex in 2 versions. IET, supplied with a fixture mount and IETi with an internal drive instead of a fixture mount. The IET and IE are ultra-short pure titanium implants. The diameter of the IET implant threads is 4.5mm, with a chamfered edge that decreases the platform width to 4.07mm. This makes the restorative platform compatible with abutments and accessories of the IB 4mm diameter External Hex implant range. The length of the implant from platform to apex is 4.1mm. The body of the implant is moderately roughened (Sa≈1.4µm). The implant body is significantly tapered, for the purpose of achieving good primary stability. The ultra-short IET implant is intended for use in the restoration of partial or full arches in severely atrophied ridges. It may be used splinted to short or standard-length implants (>6mm). They are useful in situations of difficult access, limited visibility, confined space, and high risk of affecting anatomical structures. Unless they are part of a rigidly splinted multiple implant bridge it is not recommended to load these immediately, and they are normally left to integrate for four to six months before being restored. These implants serve as an alternative to treatments such as guided bone regeneration, distraction osteogenesis, sinus floor elevation, mandibular nerve transposition, and the use of tilted or zygomatic implants. X-rays and images provided by Prof PO Östman and Prof Hilde Browaeys, Ghent University. Illustrations provided by Prof PO Östman. 2. Pistilli R, Felice P, Cannizzaro G, Piatelli M, Corvino V, Barausse C, et al. Posterior atrophic jaws rehabilitated with prostheses supported by 6mm long 4 mm wide implants or by longer implants in augmented bone. One-year post-loading results from a pilot randomised controlled trial. Eur J Oral Implantol. 2013;6(4):359–72. 3. Esposito M, Cannizzaro G, Soardi E, Pistilli R, Piattelli M, Corvino V, et al. Posterior atrophic jaws rehabilitated with prostheses supported by 6 mm-long, 4 mm-wide implants or by longer implants in augmented bone. Preliminary results from a pilot randomised controlled trial. Eur J Oral Implantol. 2012;5(1):19–33. 4. Annibali S, Cristalli MP, Dell’Aquila D, Bignozzi I, La Monaca G, Pilloni A. Short dental implants: a systematic review. J Dent Res. 2012 Jan;91(1):25–32. 5. Esposito M, Felice P, Worthington HV. Interventions for replacing missing teeth: augmentation procedures of the maxillary sinus. Cochrane Database Syst Rev. 2014;5:CD008397. With the advent of Evidence-Based Medicine (EBM), it is no longer possible to rely solely on experience, preference and didacticism – the ability to critically appraise the status quo is arguably the practitioner’s sharpest tool. Implant science has transformed itself many times since P-I Brånemark’s discovery of osseointegration in the 1960s. Today’s digital-friendly, materials-engineered implant arsenal is barely recognizable from its blade-vent and hollow-screw ancestors. Similarly, methodological quality and ethics in modern research are a far cry from the early days of ad hoc experimentation. For the manufacturer, the burden of proof is two-fold: safety and efficacy. The only way to establish these cornerstones of design is research. While trends, designs and opinions will come and go, the commitment to and curiosity about the science of patient care should never be compromised. Curated and written by esteemed academics Prof Hugo De Bruyn, Prof Pär-Olov Östman, and Dr Stefan Vandeweghe, this volume organises research from three decades of investigation into surfaces, connection systems, protocols, and patient satisfaction. Dr André Hattingh (private practice, UK) has published in the International Journal of Prosthodontics & Restorative Dentistry (IJPRD) a description of the recommended technique for placing Southern Implants ultra-wide MAX implants in post-extraction molar sockets. Dr Hattingh has performed over 580 MAX cases since the implant’s inception 10 years ago, for which the calculated total survival rate is 95.17%. 3.62% of these were early and 1.20% were late failures. In this article he presents a sequenced protocol for obtaining predictable results with this technically challenging indication. His technique is partly supported by new results from a micro CT evaluation of maxillary and mandibular first molars in dry skulls (article currently in draft(1). A recent Clinical Implant Dentistry & Related Research (CIDRR) publication by Dr Manú Van Weehaeghe and the Ghent University team reports 4-year follow-up of 20 patients who received full-arch mandibular fixed restorations in a split-quadrant design. Posteriorly, one conventional tilted implant with 24° angulated abutment was randomised to a side, and one 24° Co-Axis without abutment was placed contralaterally. 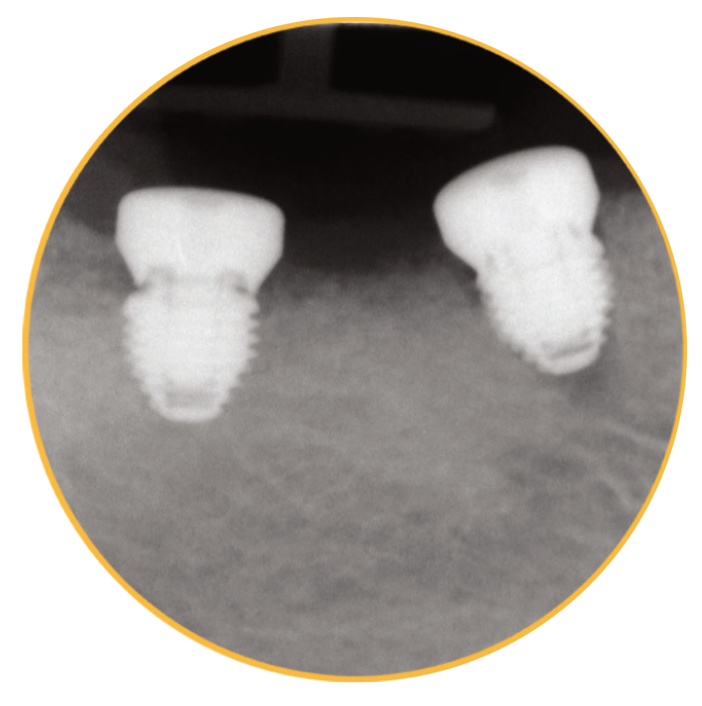 In the anterior, two conventional implants were placed, one with a compact conical (multibase) abutment and the other without. The study found no significant differences in marginal bone loss or soft tissue outcomes between either supra- vs subcrestally angle-corrected implants, nor between implants restored on implant- vs abutment-level. Overall, two angulated abutments required replacement and there were four instances of angulated abutment screw loosening. The study also found that monolithic zirconia bridge material resulted in lower plaque index scores than porcelain fused to cobalt chrome (PFM)(2). 1. Hattingh AC, De Bruyn H, Ackermann A, Vandeweghe S. Immediate Placement of Ultrawide-Diameter Implants in Molar Sockets: Description of a Recommended Technique. Int J Periodontics Restorative Dent. 2018 Feb;38(1):17–23. 2. Van Weehaeghe M, De Bruyn H, Vandeweghe S. A prospective, split-mouth study comparing tilted implants with angulated connection versus conventional implants with angulated abutment. Clin Implant Dent Relat Res. 2017 Dec;19(6):989–96. This year has gotten off to a cracking start. We have achieved important regulatory, educational, and scientific milestones that are certain to fuel our growth. Canada: Multiple products have been approved. US: The Zygan and Oncology range of implants as well as PEEK abutments have been approved. Dr Costas Nicolopoulos and Team Dubai presented a hands-on course and workshop “Less grafts more implants” using site-specific implants in December. The first ZAGA Zygoma training course with world renowned Dr. Carlos Aparicio in Barcelona took place. This was a comprehensive course on treatment of the severely atrophic maxilla involving cadavers and live surgery. The Advanced Implantology course at the Branemark Institute was fully subscribed and attended by doctors from the United Kingdom, Sweden, Australia, Namibia and South Africa. This comprehensive course is run by Prof Dale Howes, Dr. Greg Boyes-Varley and Dr. Andrew Ackermann. At the XP Global Symposium that took place in Hollywood, FL in early February, the content focus was predictable anterior implant aesthetics. Drs. Dennis Tarnow and Stephen Chu were part of a group of scientific opinion leaders invited to share their latest optimized protocols. Their incorporation of the Co-Axis Implant for predictable soft and hard tissue preservation and dependable screw retained restorations was highlighted. Southern Implants also had a substantial presence at the annual Academy of Osseointegration (AO) Meeting in Los Angeles in early March. Drs. 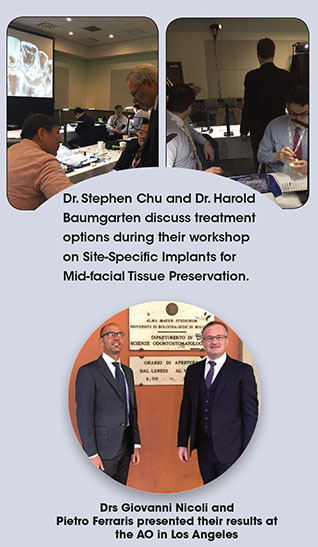 Harold Baumgarten and Stephen Chu ran a workshop on Site Specific Immediate Implants for Mid-Facial Tissue Preservation and Drs. Robert Del Castillo and Gary Morris ran a workshop on Full-arch Rehabilitation with Subcrestal Angle Correction. Dr. Michael Block and Dr. Steven LoCascio eloquently covered our site specific implants and the use of guided surgery with Southern. Dr. Veronique Christiaens presented the first of her research projects relating to our new Inversa Implant. In addition, Dr. Martin Glibert presented the Southern sponsored RCT showing that micro grooves and connection type have no effect on crestal bone levels. Dr. Ghada Alrabeah presented Southern sponsored Eastman Institute research showing that platform switching reduces the quantity of ions released into the tissues that surround dental implants. Drs. Pietro Ferraris and Giovanni Nicoli from Italy presented their growing number of cases and longer term follow-up of their Nazalus implant research project. On the main programme and in the all important final session on anterior aesthetics, the Co-axis implant was featured in the current best-practice protocol, by Dr. Stephen Chu. 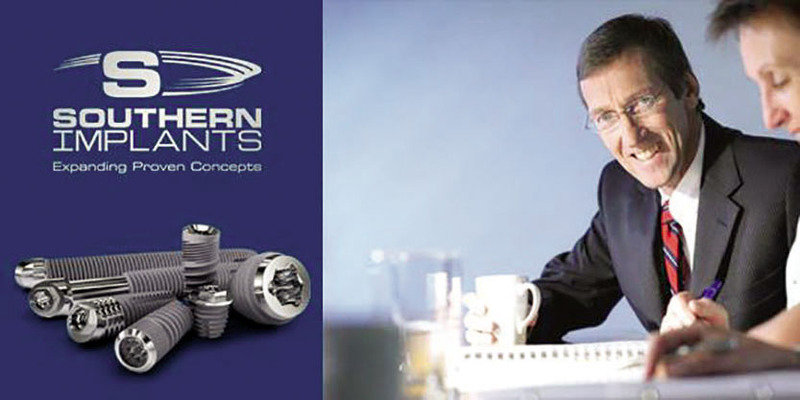 As a small dental implant company, the treatment solutions that we offer, backed by our solid research, is gaining significant attention at the premier meetings. This, together with our commitment to appropriate education, is growing our sales at more than 20% per annum in our target markets. We are extremely grateful to our Key Opinion Leaders that share their ideas and expertise with us. They, together with our staff, are the bastions of the Southern Team.